I noticed a few weeks ago that my visor garage door opener is not working. Decided to look into it today and according to the manual (below) it should be slot 1 with a 10A fuse. There was not anything in the slot so I figured it was removed for some reason while in the shop. And yes my trunk, map, and glove box lights are not working. Purchased a new fuse, tried installing it to only learn slot one is not a real spot. I looked closer and my fuses don’t match the manual. WTH? I purchased the car new and so nobody messed w it before me. I sent s message to ford asking if there are any other configurations used. They were no help. Note that other slots are being used that it says should not be. Were they working before? What kind of work did the shop do, anything electrical related? Was it a Ford shop? 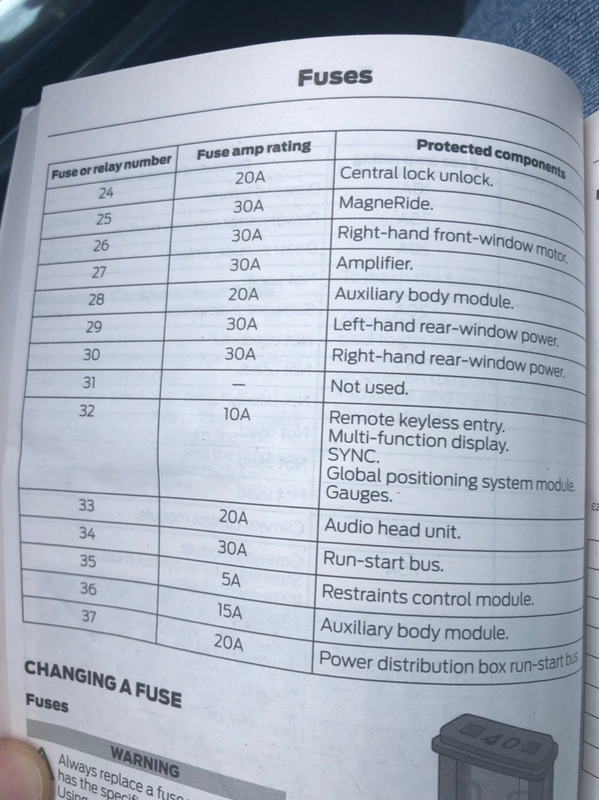 If the fuses don't match your owner's manual go online at Ford.com and download the latest version of the manual, see if it matches what you have. If the work was electrical related, that caused removal of the fuse box, the shop may have screwed something up. (10-06-2018, 05:30 PM)Don C Wrote: Were they working before? What kind of work did the shop do, anything electrical related? Was it a Ford shop? Yes it was working, Ford shop, simple 10k visit, I looked at the site, and even had an online chat w Ford. They quoted the manual that I already have. I even found videos that match the manual but not mine. Very strange. 2nd picture from the top on the left it looks like a partial picture of the fuse box. Does the numbering in that picture match what is in your car? Cars have become a computer network as much as they are automobiles. Some dealers re-flash the computer systems as a matter of routine, it causes problems. It may sound counter intuitive but, take it back to the same dealership to be repaired under warranty. You may need the paper trail down the road to prove that you made attempts to have it repaired under warranty. If they can't fix it, ask to have it elevated to the district service rep and ask them to open a case number. (10-06-2018, 11:07 PM)Bentworker Wrote: 2nd picture from the top on the left it looks like a partial picture of the fuse box. Does the numbering in that picture match what is in your car? 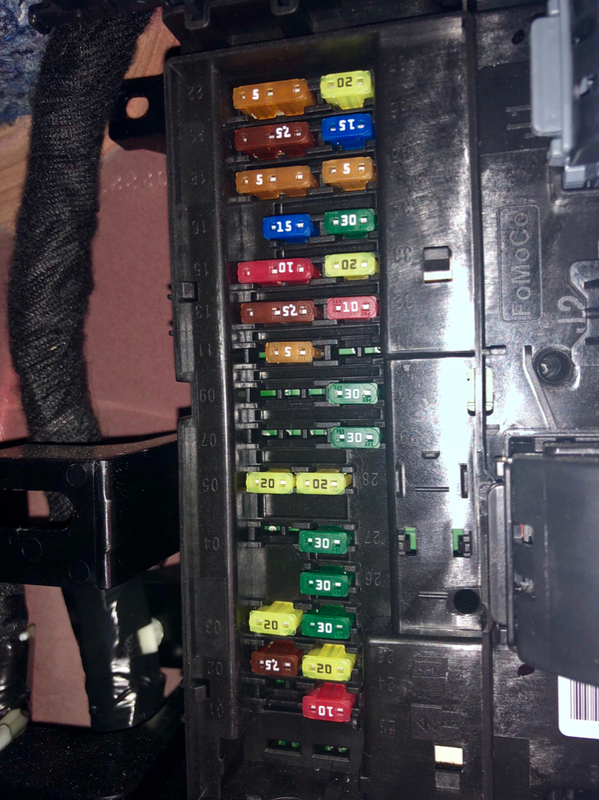 The fuse box looks the same but has some of the “not used” with fuses and some that show used, do not have a place to put a fuse. 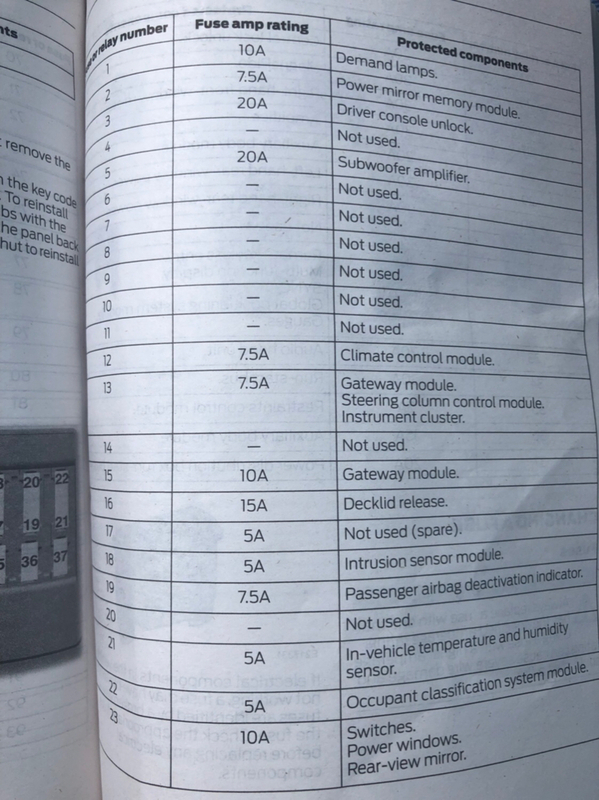 Here’s the manuals chart. (10-07-2018, 07:22 AM)c9zx Wrote: Cars have become a computer network as much as they are automobiles. Some dealers re-flash the computer systems as a matter of routine, it causes problems. It may sound counter intuitive but, take it back to the same dealership to be repaired under warranty. You may need the paper trail down the road to prove that you made attempts to have it repaired under warranty. If they can't fix it, ask to have it elevated to the district service rep and ask them to open a case number. Be nice if it didn’t mean driving to College Station (where I purchased it) or Houston (where they got it from). I asked Ford if it was because it was a Premium Edition with a Pony Package, all they would say is we only have one schematic for it. Took it to the shop in Yukon on Friday. The lights began working again (short) and that has me worried. Additionally, I have a bad creak from the rear. Took it all in for warranty work. They called Friday afternoon to say they’re still working on it. I’ll translate “we have no idea”. They gCalled this morning and said they couldn’t duplicate the issue. Asked for the manager to ride w me and he couldn’t until 4. At 4 we took a ride and it all started before we left the lot. I told him there was no way the tech had looked at this car beyond 30 minutes on Friday because my GPS system records every time it powers up, where it’s been, etc. I had even placed a geofence around the dealership to alert me. Gotta love technology. The working/not working of the courtesy lights has become more frequent. I was headed for an X-ray yesterday and noticed they were not working, pulled into the dealer and made them look. I refused to get out of the car, turn it off, etc until they checked it out. Sometimes a cycling the car and open/close door will make it work. This time they all came on and then dimmed and went off like a burn out. Finally they believe I have a problem.